Successfully Added Hand Painted Camera Painting with Wireless Remote Control (4GB) to your Shopping Cart. Become a bourgeois agent with this beautifully hand painted camera painting. It comes with 4GB internal memory to record your targets secretly and can upload its secret footage via USB to your computer. You can set it up and record your bedroom for any unusual visitors that might be invited by your spouse. Or you can place it in your office and check if anyone has been snooping around your stuff. The uses are endless and you’ll not only have a great device but a great painting too. A remote control is also included so you can remotely and discreetly control your recording of events. 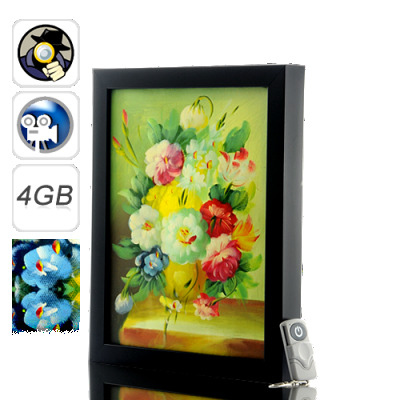 This artwork is extremely portable just hang it on the wall like any painting and it instantly becomes a powerful ing device, operational at the push of a button. With no screws or complicated fixtures to install, this device is incredibly portable, you can even take it on holiday and hang it up in your hotel room, check out what the cleaning staff are really doing in your room! At an incredible wholesale price, this Hand Painted Camera Painting is a great addition to your art collection and gadget collection. It’s now available in stock for immediate shipment worldwide. Buy one for yourself today or purchase bulk quantity to sell and profit! This deal is brought to you by your source for high tech surveillance equipment and beautiful artwork, Chinavasion. Melds in with living spaces perfectly, flower artwork complements any decor.